If you’ve ever considered using braces to straighten your teeth, you’re most likely familiar with direct-to-consumer orthodontic treatment options, such as SmileDirectClub. These companies have exploded in popularity recently—boasting their affordability and less fuss involved. However, not all aspects of direct-to-consumer treatment are good. There are strong, unwavering benefits to completing orthodontic treatment with a certified and experienced orthodontist vs. getting the quick fix of straight-to-order aligners. Here are some things you should consider before clicking “purchase” on a smile kit. The field of orthodontics is a professional medical field. To be certified as an orthodontist, doctors must go through rigorous academic study and training to become licensed as a professional in the industry. Your skilled orthodontists in Vernon Hills and Chicago are members of the American Association of Orthodontics, which is a professional association of doctors who have dedicated great time, energy, and effort into transforming smiles. When you’re orthodontic treatment is supervised by a professional orthodontist like Dr. Jacobson, Dr. Tsou, or Dr. Kim, you can be certain that your care is of the highest quality and your results will be equally exceptional. How Does Direct-to-Consumer Orthodontic Treatment Work? Many companies such as SmileDirectClub offer an easy, online way to get a new smile. You simply submit an impression and photo of your teeth using the company’s kit, and the company sends you a custom set of aligners every month or so. After completing all sets of aligners to straighten teeth, your smile will be aligned! This may sound too-good-to-be-true. And that’s because, in many cases, it is. In actuality, there is more to creating a straight, stunning smile than simply moving the teeth. Orthodontic treatment does more than straighten the visible part of your smile. Effective orthodontic treatment takes into consideration your bite, jaw alignment, facial structure, and smile/mouth as a whole—targeting all of these areas to provide you with a smile that is properly aligned and will maximize your oral and dental health as well. If orthodontic treatment is not done correctly, this can actually cause irreversible and costly damage such as misaligned bite, tooth or gum loss, and other issues. Many direct-to-consumer orthodontic treatments cannot properly assess all features of your oral and dental health and therefore, only work to correct visible issues like crookedness, gaps, or crowded teeth. To help make your decision easier, here are a few questions that are important to ask yourself when considering direct-to-consumer orthodontic treatment, such as SmileDirectClub aligners. Will X-rays be taken of your teeth and jaws? Will a clinical examination of your bite, facial profile, jaw alignment, and overall smile be taken to determine the best method for straightening your teeth? What type of treatment is offered by the direct-to-consumer company? How can you know that the type of treatment offered is the best method for your individual needs and smile goals? 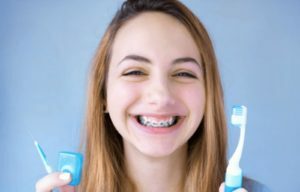 Are your teeth and gums healthy enough for orthodontic treatment, and has this been determined by your licensed dentist? Will you require any in-person office visits to a licensed dentist or orthodontist during your treatment? Is there a professional dentist or orthodontist involved in the creation and customization of your treatment? Are you provided with or able to research his or her name, practice, education, credentials, etc.? If there is a problem with your orthodontic treatment, who will be taking care of it, and who will be held responsible for it? Are you asked to sign any forms that release the company from liability should an injury or other issue occur? Who will handle any issues such as injury or an emergency, and how will those issues be handled? Based on these questions, in the end, it should become clear that trusting direct-to-consumer teeth straightening option is not the best choice. Your smile is important after all. 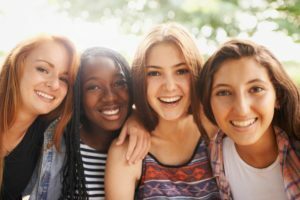 Why risk irreversible damage and take shortcuts designed for the masses, not your unique mouth and smile when you could have amazing orthodontic treatment from an orthodontist with skill, experience, and a passion for helping people get the smile they desire? If you’re looking to improve your confidence by transforming your smile, it is always best to start by scheduling a consultation with one of our Vernon Hills and Chicago orthodontists. At Jacobson & Tsou Orthodontics, we will take accurate images of your teeth and jaw, assess your bite, alignment, and facial structure, and discuss your smile goals with you. Together, we will determine the best possible course of action for your orthodontic treatment. If you’d like to know more or have any questions regarding orthodontic treatment, we welcome you to contact us in our Vernon Hills or Chicago office today. We can’t wait to help you get started! Let's start with the basic brushing tools. Our orthodontists recommend choosing either a soft-bristle brush or a bi-level brush (a toothbrush that has shorter bristles in the middle and longer bristles at the edges). Used carefully, an electric toothbrush can also work. But be sure that the electric brush you select is set to a moderate power level whenever you use it, and be mindful of the vibrations. You don’t want the back of your brush to hit your brackets or braces. Our team of skilled orthodontists advises that you brush with a fluoride toothpaste at least two times a day (preferably after meals) for at least two minutes each time. Remember to brush all teeth surfaces: outside, inside, and the chewing surfaces as well. And be especially careful to clean the areas between wires and teeth, as well as between brackets and gums — that's where food particles can easily become trapped, causing decay. 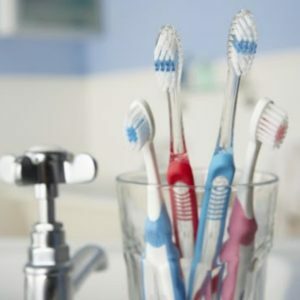 There are several tools that can make your oral hygiene routine simpler. A couple popular options include the interdental toothbrush (or proxabrush) and the Waterpik®. An interdental toothbrush has a small tuft of bristles that stick up like a pipe cleaner. It can be used to clean tiny spaces under wires and around bands and brackets. Meanwhile the Waterpik® shoots a small stream of pressurized water at your teeth, which can help dislodge bits of food that become trapped in nooks and crannies. Every day that you keep your teeth and gums healthy is an investment in your future. Great oral hygiene enables you to get the best results from your orthodontic treatment, setting you on a path to a brighter smile. For more information about brushing and flossing, inquiries regarding braces, or to schedule a consultation, please contact Jacobson & Tsou Orthodontics at our Chicago or Vernon Hills location today! We’d love to hear from you!